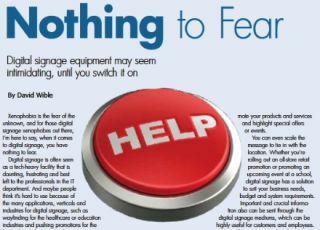 Digital signage equipment may seem intimidating, until you switch it on. Xenophobia is the fear of the unknown, and for those digital signage xenophobes out there, I’m here to say, when it comes to digital signage, you have nothing to fear. Digital signage is often seen as a tech-heavy facility that is daunting, frustrating and best left to the professionals in the IT department. And maybe people think it’s hard to use because of the many applications, verticals and industries for digital signage, such as wayfinding for the healthcare or education industries and pushing promotions for the hospitality and gaming industries. To dispel these myths, let’s explore this medium. At the end of the day, we’re all in business to connect or reach our target audience. Studies show that increased information leads to a better connection. Digital signage can build visibility for your business, which translates into stronger branding and a deeper relationship with your audience. If you can get your audience to engage with your brand, that’s winning half the battle. You can also use signage to promote your products and services and highlight special offers or events. You can even scale the message to tie in with the location. Whether you’re rolling out an all-store retail promotion or promoting an upcoming event at a school, digital signage has a solution to suit your business needs, budget and system requirements. Important and crucial information also can be sent through the digital signage mediums, which can be highly useful for customers and employees. In times of emergency, a digital signage message can be broadcast quickly and efficiently. This is where it can get a little technical. What’s involved all depends on what content you want to show on your signage, and what you want it to do. Basically, you decide what content you want to push out, and depending on how closely you want to be involved with the creation process, you can work with your team to make sure it’s a seamless deployment. Add to that a customer support element for additional guidance or service, and you’re good to go. The simple intuitive interface means even more convenient ease of use for non-tech users of digital media. Most digital media companies also offer customer support and training. The best offer it for free. Obviously this is a basic overview, but it should help you, the customer, better understand the process. And hopefully help you feel less intimidated by it. When it comes to current and potential uses, digital signage runs the gamut in communications. Applications include wayfinding, branding, promoting offers, facial detention, and the list goes on and on. Chances are, whatever you need or want to say, you can say it briefly on digital signage. Before we get too worked up, we need to remember that digital signage can be as complicated, or as easy, as you want it to be. It all depends on what your content needs are, which company you work with and which digital media management software or platform they work with. Some customers (and some companies, for that matter) feel that the level of difficulty is direct ly related to the cost of service. If you pay a lot for it, then surely it’s very difficult to use. But if you’ve been in the digital signage industry for any amount of time, you’ll know that’s very seldom the case. Some digital media companies actually want you to think that; that’s how they stay in business. So if your digital signage really is too difficult to use, maybe you need to work with a digital media management platform that makes it easy, approachable and effective, which is the way it should be.